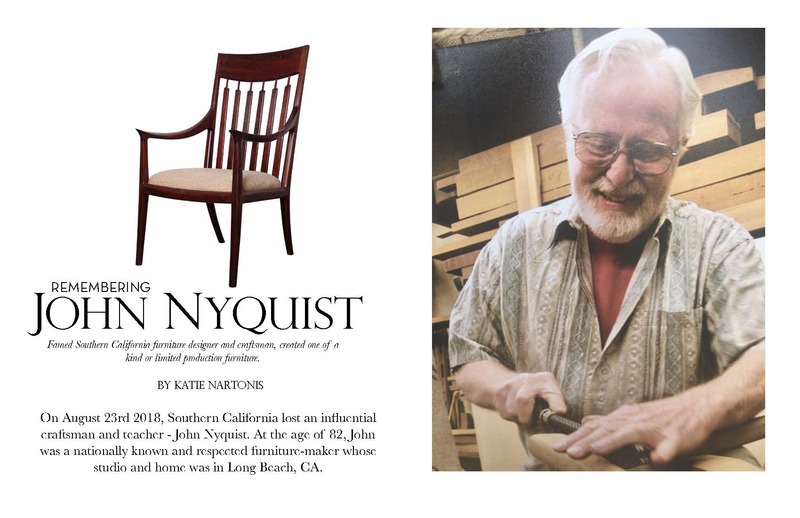 Known for his high level of craftsmanship, John Nyquist worked in exotic woods and created pieces that were impeccably made. 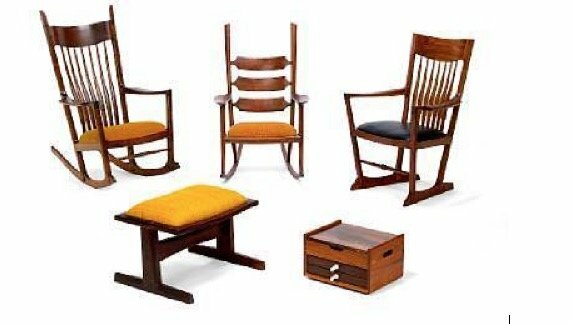 He created spindle-back rockers, upholstered lounge chairs, credenza, music stands, free-edge coffee tables, jewelry boxes and dining tables among many other forms. His careful design choices, and his religious attention to the finishing (the polishing, sanding and fine upholstery and leathers) created lusciously tactile pieces that yearned to be touched, and used. Nyquist met his lovely wife Shirley in Long Beach, when they were both in High School. They were married in 1957 and together they raised 6 beautiful children. His family notes that he had no clock or wristwatch in his studio. John was laid to rest on Saturday, September 8th at a packed service at St. Bartholomew’s Catholic Church in Long Beach. The Nyquist family and close friends gathered at the family home after the funeral for a lively and celebratory reception. There, John’s widow Shirley was surrounded by her children and grandchildren. Stories told by his students, children and colleagues remembered him as a dedicated, thoughtful, generous man and a skilled artisan and teacher. John Nyquist will be missed. Acknowledged influences on his own work are Shaker furniture, Scandinavian Design of the 1950’s and the organic shapes of nature. Nyquist’s work was shown consistently during his lifetime in major exhibitions and shows including the seminal “California Design” exhibitions (1964-1976) at the Pasadena Museum of Art. John maintained a studio practice, and a bevy of faithful private clients who commissioned his work for their homes and offices for over 60 years. In the last decades of his life, he enjoyed a national reputation as part of a small number of noted makers who led the West Coast studio-craft movement.